At Google, we're constantly trying to make important collections of information more useful to the world. Since 2006, we’ve let people discover, search, and read United States patents online. Starting this week, you can do the same for the millions of ideas that have been submitted to the European Patent Office, such as this one. Typically, patents are granted only if an invention is new and not obvious. To explain why an invention is new, inventors will usually cite prior art such as earlier patent applications or journal articles. Determining the novelty of a patent can be difficult, requiring a laborious search through many sources, and so we’ve built a Prior Art Finder to make this process easier. With a single click, it searches multiple sources for related content that existed at the time the patent was filed. Patent pages now feature a “Find prior art” button that instantly pulls together information relevant to the patent application. 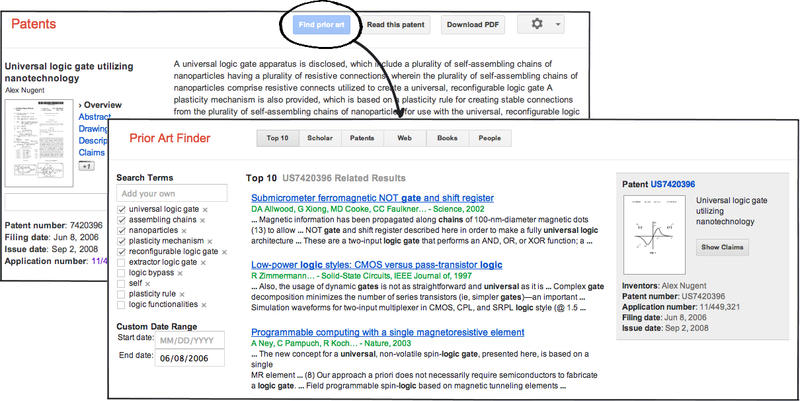 The Prior Art Finder identifies key phrases from the text of the patent, combines them into a search query, and displays relevant results from Google Patents, Google Scholar, Google Books, and the rest of the web. 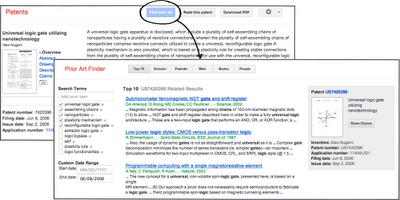 You’ll start to see the blue “Find prior art” button on individual patent pages starting today. Our hope is that this tool will give patent searchers another way to discover information relevant to a patent application, supplementing the search techniques they use today. We’ll be refining and extending the Prior Art Finder as we develop a better understanding of how to analyze patent claims and how to integrate the results into the workflow of patent searchers. These are small steps toward making this collection of important but complex documents better understood. Sometimes language can be a barrier to understanding, which is why earlier this year we released an update to Google Translate that incorporates the European Patent Office’s parallel patent texts, allowing the EPO to provide translation between English, French, German, Spanish, Italian, Portuguese, and Swedish, with more languages scheduled for the future. And with the help of the United States Patent & Trademark Office, we’ve continued to add to our repository of USPTO bulk data, making it easier for researchers and law firms to analyze the entire corpus of US patents. More to come!